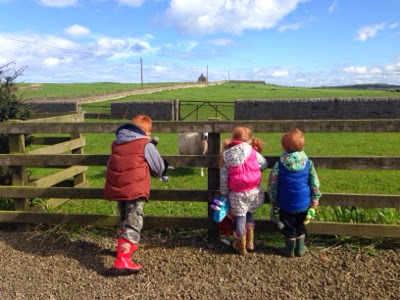 A few weeks ago we were invited to road test The Bells Of Hemscott in Northumberland. We had such a fantastic experience and would highly recommend it as a place to spend some quality family time together. 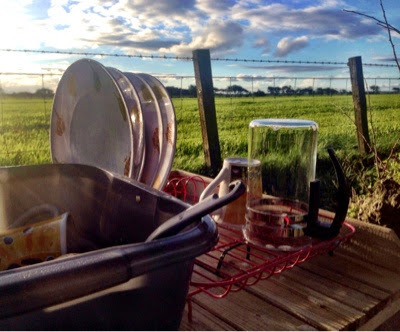 Glamping or 'glamourous camping' is for people who like spending time in the great outdoors but would like a few home comforts too. We love camping and have experienced it in every shape and form, we even survived a storm in a muddy field with a 3 month old baby once. 'Glamping' however is definitely my preferred way to camp. 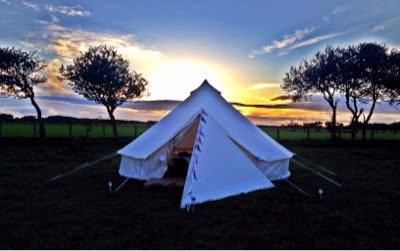 The Bells of Hemscott offer furnished pre-pitched luxury bell tents. I love not having to worry about carrying everything we need and knowing that our tent is already pitched saves a lot of time, stress and arguments. Trying to pitch a family sized tent with 3 children running around your feet and then unpacking for everybody whilst trying to keep the mud out of the tent is no easy task! At The Bells of Hemscott you don't need to worry about any of that as they have done all the hard work for you. 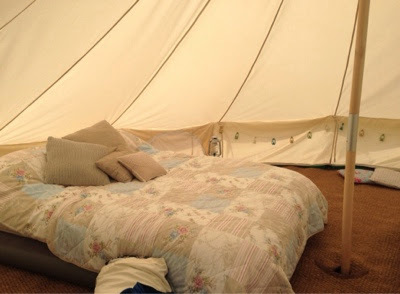 Bell tents are gorgeous. They are sturdy and very spacious (you can stand up in one). They are also extremely weather proof meaning you can camp in all types of weather. The Bells of Hemscott are furnished to a very high standard and are lovely and cosy inside. 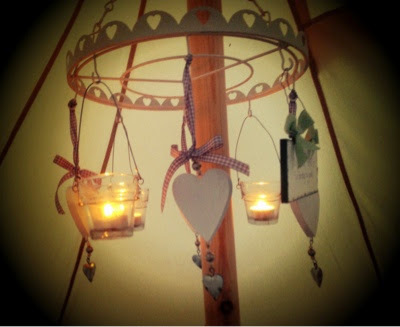 Expect luxury bedding, tealight chandelier's and beautiful bunting decorating the space. You do have to remember however that you are camping. There is no electricity here and you will have to build a fire to cook/heat water. 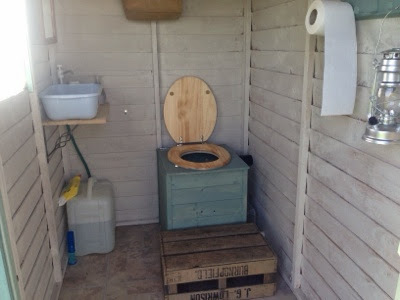 There is a composting loo (which my children seemed to be obsessed with using!!) and Eco-showers. This is also a working farm and a herd of cows live in the adjoining field (don't worry there is a fence separating you). This is all part of the fun though and I personally think having electricity here would take away part of the camping charm. 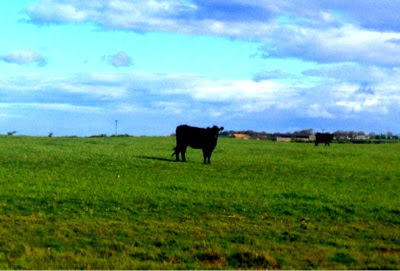 The Bells of Hemscott are located on a working farm opposite the gorgeous Druridge Bay beach. It is about a 10 minute walk from the field to the beach. The beach here is pretty quiet and unspoilt and perfect to explore. 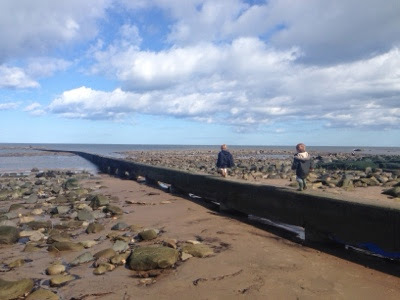 You can head up the road for a mile to Cresswell where there is another beautiful beach and the famous Cresswell Ices ice cream shop where you can buy ice creams, sweets and treats. These beaches are also some of the best places in the UK to go star gazing at night and take in a 'dark sky' experience. Half a mile up the road in the opposite direction to Cresswell takes you to a lovely little farm shop and tea room where you can buy local meat, local delicacies and baked goods (the scones are lovely). There are a few pubs within 3 miles with The Widdrington Inn and The Woodhorn grange being the closest. 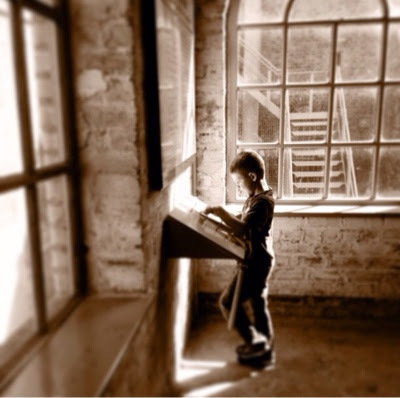 (the woodhorn grange has an indoor and outdoor play area). 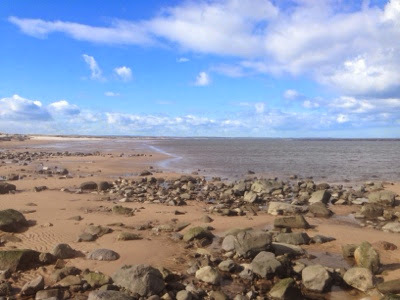 Warkworth Castle, Amble harbour (fab fish n chips) and Experience Woodhorn (lovely free museum featuring the area's mining heritage) are all a short drive away as is The Druridge Bay Country Park with it's visitor centre, wildlife, walks, park and watersports. The best thing about camping here though is that you feel like you are in the middle of nowhere and actually have time to spend with your family. 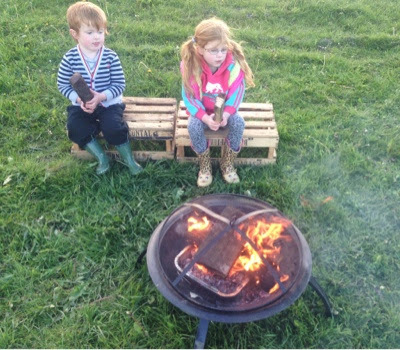 We loved collecting fire wood together and then watching dad build a fire. We enjoyed cooking sausages together and eating them al-fresco on the picnic tables and we loved making our own hot chocolate together over the campfire (all equipment and instructions are provided so don't worry if you aren't sure how to cook on a camp fire or with an outdoor stove). 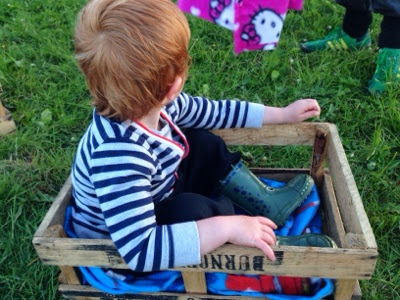 There are various crates around the site and our children invented their own games using the crates as boats. Camping really gives children time to let their imagination go wild. 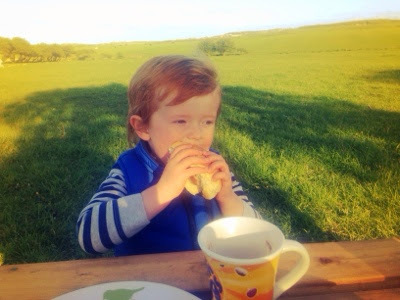 The camping field is huge but fully enclosed so your children can run and explore under your watchful eye. I also like that the Bells of Hemscott are on a farm and we could say hello to the animals whenever we wanted to. They have thought of everything at The Bells of Hemscott. 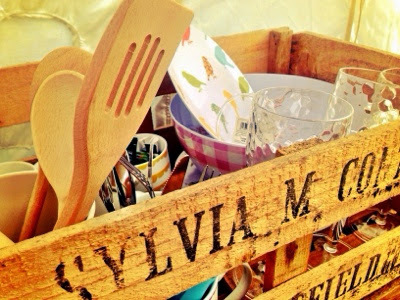 Your beds will be made up on arrival with beautiful bedding, there are crates containing all you will need for your stay from pots and pans to cups and saucers. Even Eco-washing up liquid and drying racks are provided! 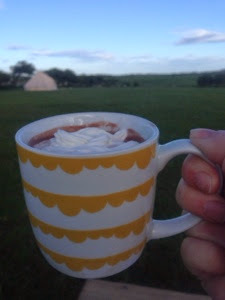 When camping with children though, there are a few home comforts I would pack. 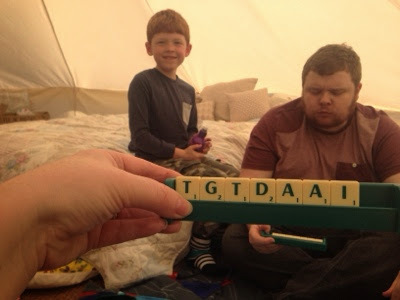 We took a few board games and a pack of cards to play in the tent. This is essential if the weather turns bad. 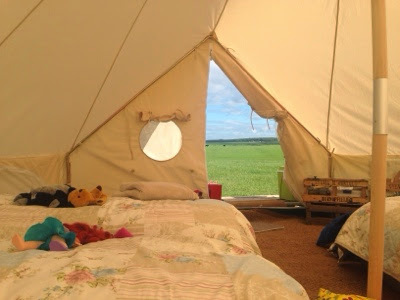 The tents are very cosy inside and floor cushions are provided. Even in summer it will get very cold at night. I would recommend taking a hot water bottle each and layers for sleeping (onesie's over PJ's are great). 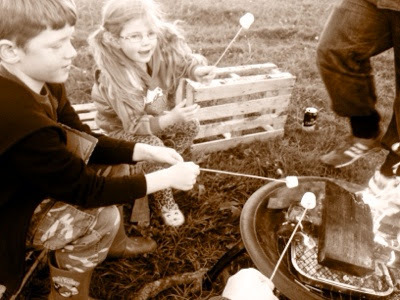 We also packed marshmallows and bamboo skewers to toast on the campfire. They are inexpensive and take up no room but really add to the magic of camping. I would also recommend you pack wellies whatever the weather as in the UK heavy rain can strike at any time! Plus a pair of slippers to wear inside of the tent as outdoor footwear is not allowed inside your tent but the floor can be a little bumpy if you are only wearing socks. The tents are a 10 minute walk from the farm but Alison will kindly transport all of your luggage in her trailer for you. If you think you will be visiting the beach leave your buckets, spades and nets in the car and pick them up en-route to the beach. You might want to pack a beach towel too. The Bells of Hemscott are already pretty perfect but there are lots of plans bubbling away for the future including on-site pizza ovens, outdoor catering and a nature trail around the farm. Alison and her family are really passionate about their bell's and will go out of their way to make sure you have a fabulous time. We can't wait to visit again soon. good review. We love camping. We either take the full on experience with a tent or hit a cabin, mobile home. We would be camping year round if we could. We never really have a plan when we decide to go either so that makes it all the more fun. It is awesome unplugging from the high speeds of life to be able to unwind with outdoor life. Thank's for sharing.